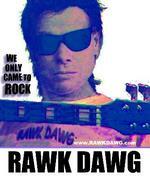 Sign up for Broadjam today to follow RAWK DAWG, and be notified when they upload new stuff or update their news! We Only Came To ROCK! "We Only Came to ROCK" is RAW ROCK - Under Produced in a more Classic Rock sense. "We Only Came to ROCK" is RAW ROCK - Under Produced in a more Classic Rock sense. This is RAWK DAWG's 2nd CD released in 2004 as a follow up to their intial CD "Rock With an Attitude" which was released in 2002. Music Connection said "Thumbing it’s snout at studio trickery, this Dawg’s concept is to have it’s members plug in and – with no prior rehearsal – rip into some from-the-gut blues rock music until an “unpolished gem of rock” emerges. On the band’s second full-lengther, the results are right up any classic rock fan’s alley. Robin Trower, Bad Company, Steve Marriot and Grand Funk are all avidly channeled by these seasoned, hard-hitting musicians. “Are You Still My Lover” stands out.